“Stay out of White Sox business!” – a phrase that has become synonymous with Sox, Executive VP, Kenny Williams back from his GM days. Apparently, Kenny wants to make it clear that he’s still in charge and Rick Hahn reports to him. I think Kenny is having Theo envy, stick with me on this. Let’s be honest, up until Hahn headed out of town a few weeks ago on a scouting trip to the Dominican Republic, Williams was barely a blip on the radar. Knowing that Williams’ ego can barely fit in a room with anyone, I think he’s upset that Theo Epstein gets all the press with the Cubs. The press coverage of the front offices of both teams has been at polar opposites since Epstein/Jed Hoyer took jobs with the Cubs and Hahn has taken over as GM for the Sox. Hahn gets all the attention from the press for the Sox good or bad, and Epstein gets all the press for the Cubs, in fact, I barely ever hear Hoyer’s name in regards to moves or decisions from the Cubs. As the story has unraveled over the last weeks from the Southside it kind of all became clear to me that perhaps the issues with everything White Sox since 2005 is Williams. The more and more I hear Williams talk it brings me back to the infamous Jerry and Jimmy relationship back in the Dallas Cowboys’ heyday. Jerry Jones basically fired Jimmy Johnson because he wanted all the credit for the team, good or bad; he wanted all the media attention and could not stand Johnson being in the limelight. That’s basically the same situation on the Southside of town. Hahn was listed as the Top GM candidate slated to go elsewhere in 2013 if Williams didn’t receive a promotion or retire, but Jerry Reinsdorf recognized this and promoted both Williams and Hahn. 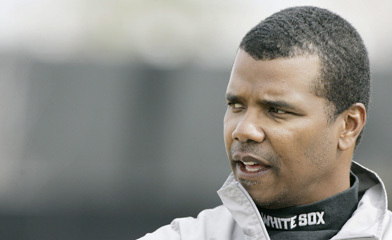 I do recall, and I’m paraphrasing this, that Williams was quoted when the promotions took place, “this is Rick Hahn’s team to run…” Oh what a difference a few years makes and how “Guillen-esque” it was of Williams to “take blame” for the team’s current state. That leads me to my next point, perhaps Ozzie Guillen was never the problem at all, and the problem has always been Williams, the one consistent through all this. I mean, how could it not? Ozzie begged Williams to give him a team with the make up of the 2005 team over and over again. Let’s not wait for the homer to win a game, let’s have high .OBP guys that can take two bases on a single with a slugger or two in the middle of the line-up. Instead, Williams kept bringing in older and older veterans to try and add power to a line-up that by the time Guillen quit was as far removed from the 2005 World Series team as any team could have been. Ozzie is not completely innocent or should I say his family is not, with the kids tweeting things that should have never been tweeted, but perhaps they too had become frustrated with the situation that their Dad was going suffering through the last few years of his existence on the South side. Then, instead of getting a “real” manager to take Guillen’s place, the Sox hire Robin Ventura, an ex-player with no professional coaching experience at all. Williams basically hired a puppet that would give him very little grief while he was GM of the team. One of the more selfish decisions I’ve ever seen as a fan, but Williams used the Reinsdorf’s “loyalty” issue to get him to approve the move. Way to buck the system Kenny! Why would you bring in a manager with no coaching experience if you truly wanted to compete, you wouldn’t. No matter whom you surround them with it comes down to the manager making the decisions, and Ventura is not very good. Back to ’05 for a moment… while Williams gets a lot of the credit for 2005 lets not look past that the Sox farm system was ranked #1 in 2000, a nucleus that was built from Ron Schueler, who was a special adviser to Williams through 2002. Yes, Williams did make some moves that worked out well in 2005, but a lot of what was on that team was courtesy of Schueler. When I look at all of this information I can’t help but feel that its time for Williams to go, to go elsewhere and try his baseball expertise on another club or lack there of. The best move the Sox could make at the trading deadline would be to trade Williams to Toronto for Mark Buehrle, the player he thought was “too old” to pitch effectively.